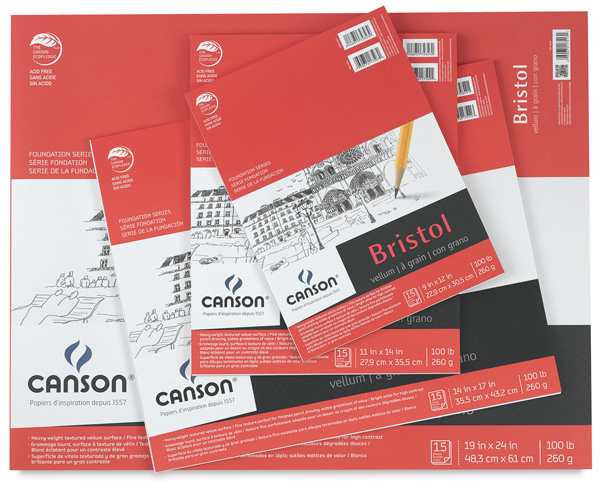 Acid free, economical bristol-weight paper is suitable for pencil, marker, pen, pastel, and charcoal. Tape bound pads contain 15 sheets. Choose from either a smooth surface or a textured vellum surface. Sheets are a bright white color for high contrast. Smooth — Bristol Smooth is ideal for fine work in pen. Vellum — The fine texture of Bristol Vellum is perfect for finished pencil drawings and subtle gradations of value.